Don’t snooze through your 20s. Most of us have an internal alarm clock that goes off when we’re about to make a bad decision. Yet some of us spend our 20s hitting the snooze button. Steve Farrar urges you to wake up so you don’t ruin your life by 30. Although the book title and chapter titles are ironic and humorous, the wisdom contained in this book is not to be taken lightly. Steve invites you to take seriously the choices you make in your 20s and learn from the mistakes of others rather than making your own. Steve also helps you recover from poor choices made in the past and make better ones in the future. 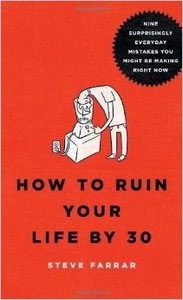 So if you really want to ruin your life by 30, don’t read this book. Just keep hitting that snooze button.